Bridges have long been a thing of fascination in the human mind because of what they connote: connection. Even though much of our communication is carried out via email or telephone, we are still nonetheless a sociable bunch. We go places, see things, visit people and experience life, all of which requires movement and interaction. 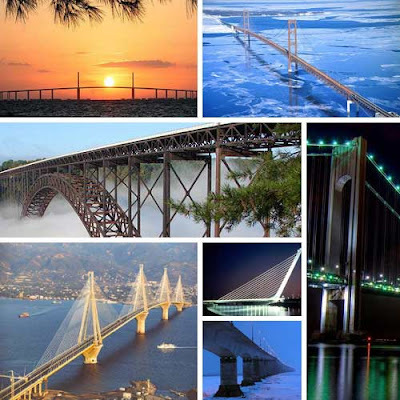 Bridges are therefore a facilitator of connection in the broad mesh of human social life. Continuing on from our previous exploration of 18 stunning bridges, we take a further look at 10 more of the oldest, newest, biggest and best bridges in existence today from around the globe. 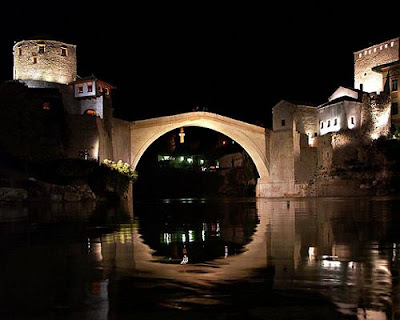 Stari Most: Commissioned originally by Suleman the Magnificent in 1557, Stari Most connects the two parts of the city of Mostar in Bosnia-Herzegovina, crossing the River Neretva. In 1993, during the Bosnian War, the bridge was destroyed by the Croatian Council of Defence, however its reconstruction was completed in 2004 and the bridge still stands proud today. Popular with locals and tourists alike as a platform to dive from, the bridge is 24m above the river below, 4m wide and 30m long. It is supported by two limestone abutments which connect to wing walls along the water cliffs, each erected to a height of 6.53m. The unusual hump shape of the bridge is claimed to be caused by buckles in the inner arch, allowing for its unique and photogenic appearance. 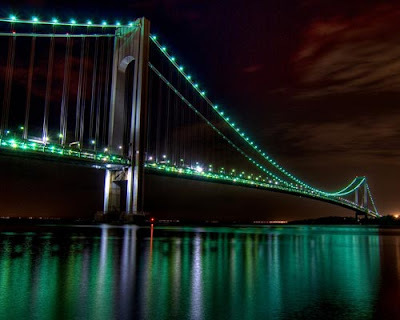 Verrazano-Narrows Bridge: Named after Giovanni da Verrazano, the first man to sail into New York Harbour, the Verrazano-Narrows bridge connects Brooklyn and Staten Island, and was the world’s longest suspension bridge upon completion in 1964. Each of the enormous towers weighs 27,000 tonnes, and they are further apart from one another at their tops than at their bases, as the 4,260ft distance between them forced construction to compensate for the earth’s curvature. However, it is the steel cables which allow for the more interesting reading, as the expansion of the metal makes the bridge a full 12ft lower is summer than in the winter months. 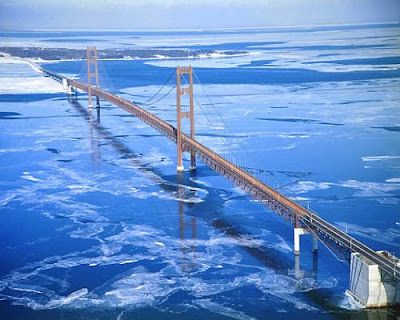 Mackinac Bridge: The Mackinac Bridge, often referred to affectionately as ‘Mighty Mac’ or ‘Big Mac’, connects the Upper and Lower Peninsulas of the US State of Michigan, and its 8,614 feet suspended length makes it the longest suspension bridge in the Americas. Although the bridge itself is just over half a century old (construction having been completed in 1957), plans to cross the straits of Mackinac originally emerged as a reaction to the opening of the Brooklyn Bridge in 1883, with locals happy to facilitate easier crossing of the waters. Two years after the $99.8 million construction was completed, US Air Force pilot Captain John Lappo lost his flying privileges after taking his plane underneath the bridge, its 200m vertical clearance violating rules on flying altitudes. For a slightly safer (and legal) way to enjoy the view, the bridge functions as a $3 toll for Interstate 75 today. 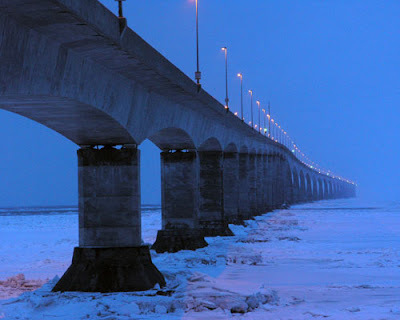 Confederation Bridge: Although aesthetically the Confederation Bridge may not be able to compete with other bridges on the list, its size and the amount of effort which went into its construction more than make up for its physical beauty. The idea to cross the Northumberland Strait with a ‘fixed link’, as opposed to the increasingly inefficient ferry service, had been around for a number of years, but it wasn’t until the 1980s that plans began to develop to link Prince Edward Island and New Brunswick. The bridge was finally completed in 1997, at a total cost of $1.3 billion. It is supported by 62 piers, the majority of which keep the bridge around 40 metres above sea level, although there is a 60m peak which allows shipping traffic to pass underneath. The bridge will be managed privately until 2032, when management will be handed over to the Government of Canada. 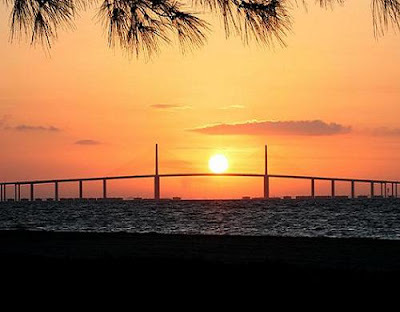 The Sunshine Skyway Bridge: With its 5.5 mile length, the Sunshine Skyway Bridge in Florida is the longest cable-main stayed bridge in the world and cost an enormous $244 million to build, construction being completed in 1987. This steel and concrete structure is supported by 12 steel cables, each one clad in 9 inch steel tubes. However problems arose when the steel inside the concrete precast segments began to corrode, but workers were able to get inside the hollow segments and provide vital reinforcement. In 1980, a freighter collided with one of the bridge’s support columns, causing a section of the bridge to collapse into Tampa Bay, sending six cars and a Greyhound bus into the water from a height of 150 feet. Of the 36 people involved, only one survived, although he did managed to sue the freight company for a hefty $175,000! 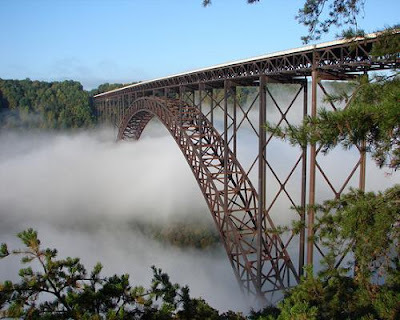 New River Gorge Bridge: Built in 1974, the New River Gorge Bridge is the world’s second highest vehicular bridge, second only to the Milau Viaduct in France. It’s unpainted steel appearance may not make it that spectacular to look at, but it saves what would have been the $1 million needed to regularly repaint bridge, and more often than not, it’s not the bridge you find yourself looking at. 876 feet above the New River rapids, the bridge is 3,030ft long and offers spectacular views of the gorge below, one of the largest draws for those who flock to the bridge on the third Saturday of October each year to celebrate ‘Bridge Day’, an annual tradition which halts Highway 19’s traffic for the day as base jumpers and abseilers take full advantage of the picturesque location for an adrenaline rush. Chesapeake Bay Bridge Tunnel: Although not strictly a bridge on its own, the Chesapeake Bay Bridge Tunnel (CBBT) simply has to be included because of its sheer size and engineering prowess; it was labelled as ‘One of Seven Engineering Wonders of the Modern World’ in 1965. Stretching to around 23km, CBBT is the primary way of crossing the mouth of the Chesapeake Bay, and connects Virginia Beach / Norfolk with Virginia’s eastern shore via a series of bridges and tunnels. Construction began in 1960, to be completed 4 years later, and the $200 million project was funded completely by private toll revenue bonds. In 1995, for almost the same cost as the original project, new two-lane parallel trestles were added to decrease traffic volume, although plans to replace the two underwater tunnels were scrapped as cost estimations came in at an enormous $900 million. 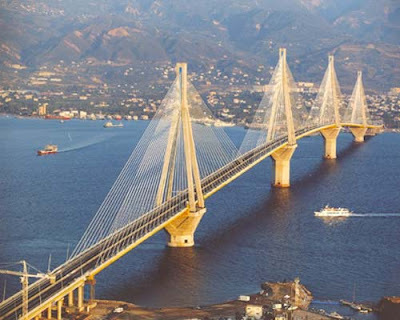 Rio Antirio Bridge: If ever a construction deserved recognition for the sheer difficulty of the task, the Rio Antirio bridge in Greece must be it. It is impressive in itself that is boasts the second longest cable-stayed deck in the world at 2.252m, beaten only by the Millau viaduct in France, but such an achievement is only enhanced by the conditions placed on the construction. The piers which support the bridge could not be buried in the 65m deep seabed, made up of mostly loose sediment, thus a painstakingly levelled bed of gravel was laid under water to provide something for them to rest on. The risk of seismic activity and tectonic plate movement also had to be taken into account, with the piers able to move laterally underwater in the event of an earthquake allowing the gravel beds to absorb the vast majority of the shock. The parts of the bridge itself are connected using jacks and dampers, allowing for movement of the parts during an earthquake without seriously damaging the bridge structure itself. Opened just in time for the Athens Olympics in 2004, the bridge is perhaps one of the most spectacular of its kind as far as engineering is concerned in the world. Brooklyn Bridge: Upon its completion in 1883, Brooklyn Bridge was the largest suspension bridge in the world, and was generally considered as one of the most technically spectacular achievements of the day. 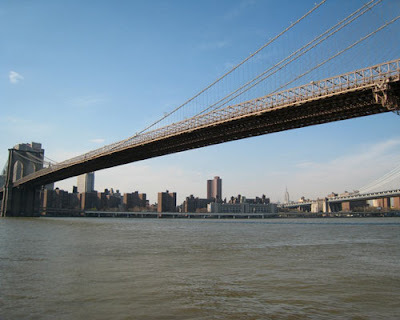 The bridge soon developed into a vital transport link between Manhattan and Brooklyn, and is still used extensively today with over 140,000 people crossing the bridge, whether it be in the car or on foot, on a daily basis. The bridge was originally designed by prolific German bridge designer John Augustus Roebling and is generally considered as his greatest achievement, although he didn’t actually live to see the bridge completed. Ill health also disabled his son, Washington, who inherited the project from his father, and it was left to Washington’s wife, Emily, to oversee project completion. Roebling’s design legacy however was vital in the bridge’s longevity; he designed the bridge ’six times stronger’ than it needed to be, which is why it remains fully functioning today, 125 years after construction finished, when other bridges of the same era built with a similar lack of technology have perished. Puente del Alamillo: Easiest translated into English as ‘The Alamillo Bridge’, Puente del Alamillo crosses the Canal de Alfonso XIII in Seville, and was built to provide access to La Cartuja island, the site of the World’s Fair in 1992. 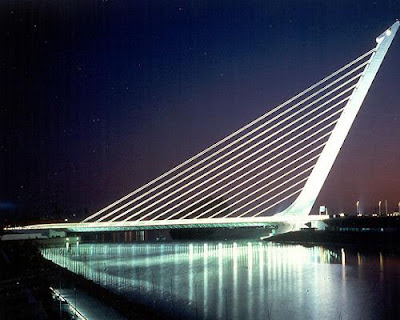 Designed by Spanish architect Santiago Calatrava, the bridge is noted for its striking design, a huge pylon which, with the aid of 13 connecting cables, counterbalances the 200m main bridge span. The bridge is renowned for looking particularly spectacular at night time when lit up, and is supposed to represent the ësoaring aspirations’ of the city itself. Originally, the bridge was designed as half of a pair, the symmetrical reproduction of the current construction to go at the other end of the island. However, designers decided the current one pylon construction was more spectacular aesthetically, and the sister bridge was abandoned. This is the second bridge to cross Tampa Bay that bears this name. It was the "old" bridge that was struck by a barge in 1980. It consisted of two cantilevered spans, and it was the southbound portion that collapsed as a result of the impact. What about the Millau viaduct in south of France? 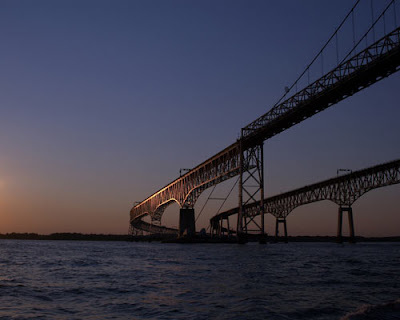 The photo for the Chesapeake Bay Bridge and Tunnel is actually the Bay Bridge that connects Annapolis, MD to Maryland's Eastern Shore on the Delmarva Peninsula. The CBBT has no cable suspension. what great photography! great article!